After enabling Smart Compression function, you can compress most types of static files, so as to reduce the size of content transmitted by users and accelerates the content delivery. Notice When we are optimizing your page, the file's md5 value will be changed. It will be different from that of the file I your origin site. Do not enable this feature if your origin site has some verification. Go to Domain Namespage, select the domain name, then click Manage. 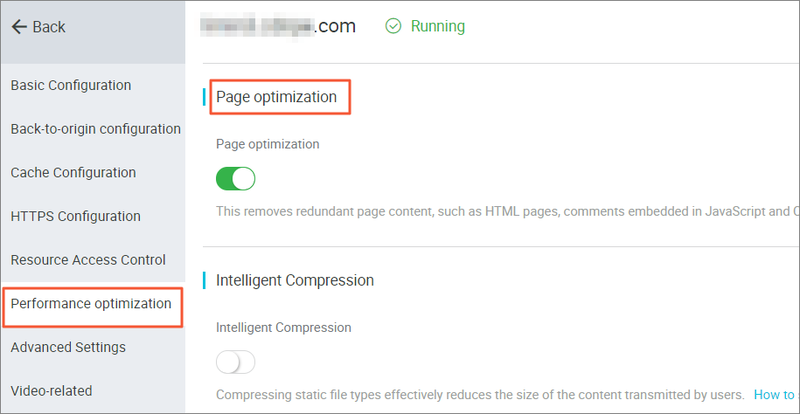 Enable the function in Performance Optimization > Smart Compression.